Gardening in Bales of Straw – Johntheplantman's stories, musings, and gardening. My friend Joel loves his vegetable garden. He works in it nearly every day. 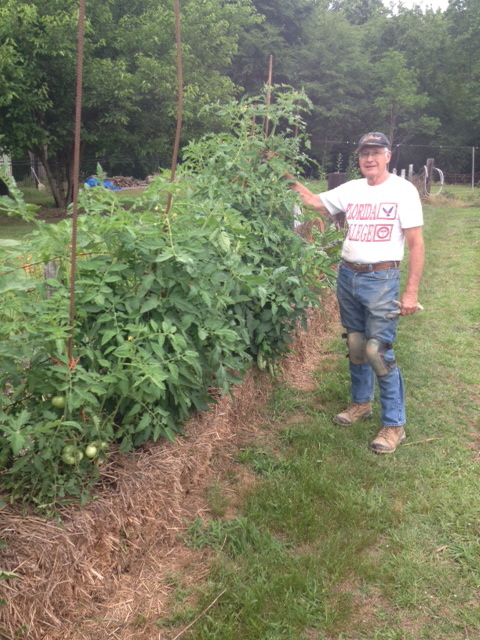 I went to see him the other day and he showed me his latest project of interest—growing vegetables in bales of straw. I had heard before about the practice of growing vegetables in straw bales—my brother tried it one year but he lives far away and I was not able to see the results. I was, however, rather impressed with the lush growth of Joel’s straw-bale garden. Joel, of course, was having a good time showing off. The plants looked large, green, and lush for the first of June. “It’s best,” he said, “to get the bales in the fall and place them where you want them. This way they will have the benefit of the nutrient-rich winter rain and snow. 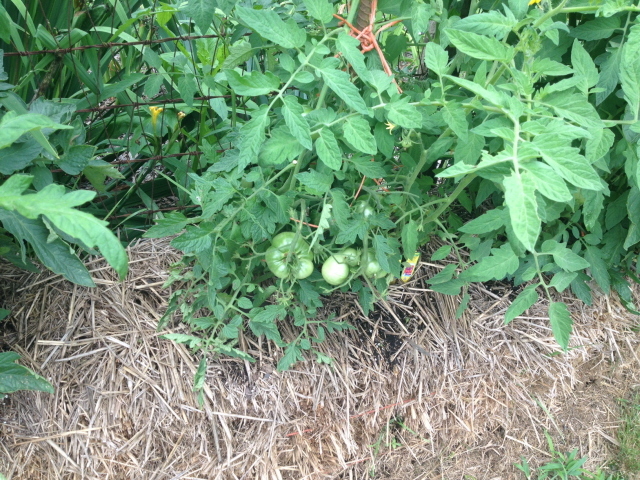 I could tell that the garden was about to produce a bumper crop of tomatoes. The plants looked good and I noticed a good fruit set. 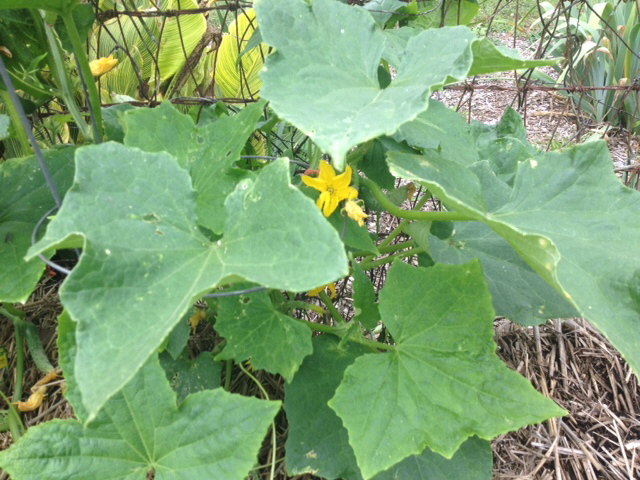 Some of them were about big enough for some ‘fried green tomatoes’—mmmmm. One of the advantages that I immediately saw was that the plants are (of course) up off of the ground and, therefore, less prone to become infected with as many types of mold, fungus, and insects. I think that the main problem with this kind of gardening would be getting the necessary balance of nutrients (fertilizer) to the roots of the plants. I would also think that a good sprinkling of lime would be beneficial. 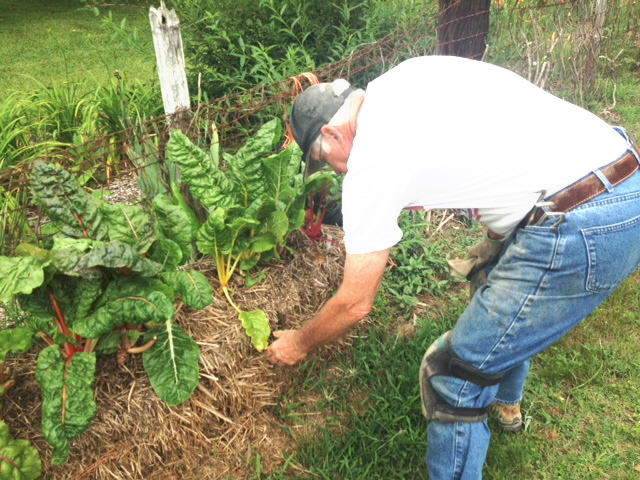 Joel and I both stopped to admire the Swiss chard. 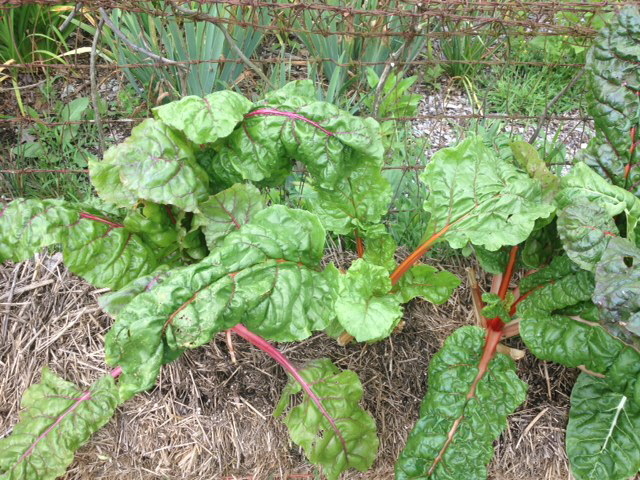 I will admit that I don’t know much about eating chard, but it sure is a pretty plant. Actually, I guess just about any garden vegetable and most flowers could be grown in this manner. As we looked through the straw-bale garden, I noticed one other benefit—there were only a few weeds and those were easy to pull. Joel bent over and pulled a few weeds and then stood up and held them aloft with a grin on his face that reminded me of a small, devilish boy showing off his trophy snake. It made me smile. There are books on the subject of growing in straw bales, but I really don’t think there is that much to learn about the subject. I noticed that the bales had been placed sideways with the strings to the sides instead of to the top and bottom. This would keep the bales from falling apart. A vegetable garden, of course, needs a lot of sun and that would be a necessity. I thought the soaker hose was a good idea—both for effectiveness of application and for water economy. You could do this on the side of a hill, also, if you turned the bales so that the ends went down hill. That would keep them from turning over. One other benefit—at the end of the season, the bales should be pretty well used up but the straw will have started to rot and will be full of good nutrients. This is the main ingredient in good compost. I’m going to keep watching to see what Joel does as the project continues. A year or so ago we built a designer herb garden for Joel. I wrote an article that gives the construction details that you will find here: Building an easy-to-tend raised herb garden. The herb garden is really looking good and I will write an article about it next week. If you are a follower, you will know that I took a bit of a vacation from the gardening blog. I was working on two related projects. The big one was finishing a book from my cancer experiences about facing cancer with humor and optimism. The name of the inspirational book is “Sweetie Drives on Chemo Days” and it has been well-received as a good read, a comfort, and a thoughtful gift. Nice Plant, no Tomatoes? Cure or Prevent Blossom End Rot. Check out the three sister garden at Chieftains. It is in hay bales ! Behind the rest room building.